Current members are the most effective individuals for recruiting new members to Pilot. If you know people who may be interested in joining our amazing international movement, please tell them all what it means to be a Pilot. 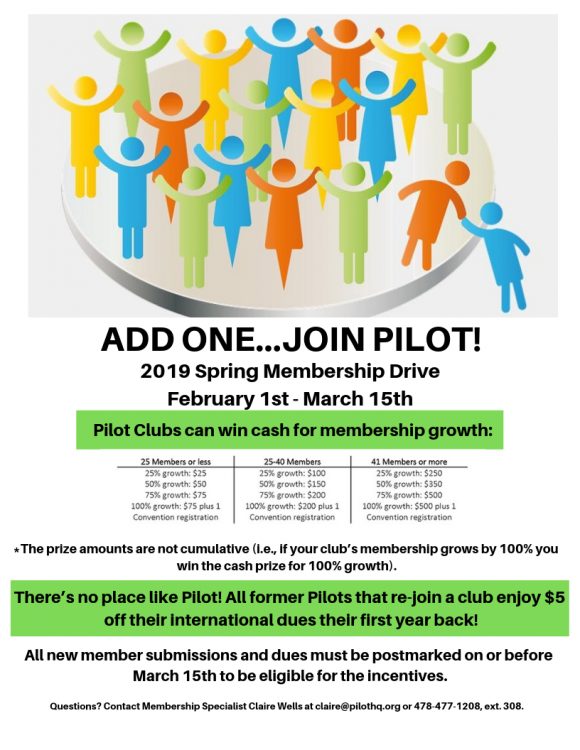 Explore our membership drive page and use its valuable resources to help you spread the word about Pilot International. Now let’s get out there and grow! Why are new clubs and members essential? Pilot International’s over-arching strategic imperative is community service and impact. Through membership growth, we increase community service and impact. Through membership growth, we drive down overhead costs and drive more funding to our community services. Growth is essential to Pilot’s continued legacy. Do you need a copy of this flyer to share with others? If so, click the link below to view, download, or print your copy. Pat Vickers & Surelle Pinkston share a piece of their story. Pilot Members Pat Vickers and Surelle Pinkston share some of their awesome experiences within the organization. Watch the video to see them talk about some of the things they really enjoy about being a Pilot member. If you liked this video, make sure to share it with friends and family as well as anyone who might be interested in joining pilot! Pilot Members Bessie Brown and Era Hall share some of their awesome experiences within the organization. Watch the video to see them talk about some of the things they really enjoy about being a Pilot member. If you liked this video, make sure to share it with friends and family as well as anyone who might be interested in joining pilot! Bessie Brown & Era Hall share a piece of their story. Attend festivals, fairs, and expos. You can use these events to get the word out about Pilot. Make sure to connect and communicate with the event organizers and staff. Ask them how you can have a booth or table of your own. Use Social Media Create a Facebook page and promote your events. Be aware that younger audiences may prefer other platforms more. Other social media platforms include Twitter, Instagram, and Snapchat. While you may want to increase your social footprint among all of these, try to focus on the platform your most comfortable in using. Energize Current Members Current members are the most effective individuals for recruiting new members to Pilot. Make a plan and get everyone on the same page.Set achievable goals for your membership drive. Make sure to also celebrate any success you have. Host Public Events Host an open house and invite work, church, and school friends. Encourage them to invite someone to tag-a-long. Prepare a unique activity or have a prominent local speaker come by. This open house meeting should aim to be fun and informative. It can be in a formal or informal setting. Print Marketing Material Pilot International has a lot of resources you can use in print form on our website. Please don’t feel limited in using what Pilot International provides. If you have a great idea for a print piece go ahead and get it printed. Many times what your local Pilot Club creates will be more focused on your local community and may end up working better. People digest information in different ways, the more methods you use the greater your success is likely to be. Target Your Audience Narrow your target audience focus. While it would be amazing to get out and personally let everyone know about Pilot, the reality is that you’ll only have time to talk to or connect with a limited amount of people. Having said that, try to reach out to people who may be more likely to become Pilot members. An example of a narrowed target is a parent who has children that recently went off to college. These parents may be looking for an organization just like Pilot International to both make friends and serve their communities. The keys is to narrow your focus so that you make sure to reach out to all of the likely candidates before you exhaust your membership drive energy. Fill out the form below and we’ll match you with the Pilot Club in your area. It’s really that easy. You’ll be invited to the next Pilot Club meeting and after that its up to you to decide if you want to be a part of Pilot family. No pressure, no worries, we promise! Email contact@pilothq.org for any inquiries related to this membership drive.